The 2017 Evoque convertible is fitted with a turbocharged 2.0-liter 4-cylinder engine making 237 horsepower and 250 lb-ft of torque, power is sent to all four wheels through a 9-speed automatic transmission. Performance is acceptable rather than sporty and the rear seats and cargo area are below par. Handling is sharp though and the Evoque convertible is fitted with a Terrain Response system that gives it class-leading off-roading abilities. With no direct competitors, this compact luxury SUV can afford to sacrifice practicality for style and the Evoque comes packed with equipment too, 12-way powered front seats, navigation and a 10-speaker Meridian audio system are standard. On the top HSE Dynamic trim level you can also opt for available features such as a head-up display, park assist and adaptive LED headlights. Here's the problem with convertible SUVs: People buy SUVs because they are practical, tough, and have the ability to haul lots of people and stuff. People buy convertibles because they are good looking, low slung, and sporty to drive. Convertible SUVs are none of these things. After the colossal failure of the Nissan Murano CrossCabriolet, many believed that the convertible SUV idea was dead forever. However, Land Rover seems to think that it can succeed where Nissan failed. Is the Evoque Cabriolet doomed to fail? Surprisingly, we think the convertible Evoque has the potential to succeed. To explain why, we need to go back to what's wrong with convertible SUVs in general. The Murano CrossCabriolet proved that a convertible SUV was not practical, or sporty. The car only had two doors and four seats with a tiny trunk. This meant it was crap at hauling stuff around. Also, because the car weighed 4,435 lbs and had a high ride height, it wasn't fun to drive. Toss in other issues such as blind spots and awful looks, and it's easy to see why this car failed. Looking at the Range Rover Evoque, it's clear that Land Rover hasn't erased all of these issues. Like the Murano, the Evoque Convertible will have only four seats and a tiny trunk. However, the Evoque has one thing that the Murano never had, genuinely good looks! 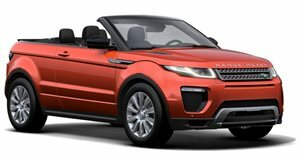 The Evoque almost looks like it was designed to be a convertible from the beginning. Unlike the Murano, the Evoque was already offered as a sleek coupe with lines that look good with the roof cut off. The Evoque convertible actually looks great with the roof up or down. The Murano had that weird roof with two rear windows that just looked awkward. We don't think the Evoque will every be a huge volume seller, it's just too weird for that. Although other manufacturers think that Land Rover is doing something right. Mercedes-Benz has even considered turning the GLC into a convertible pending the Evoque's success. Only time will tell wether Land Rover can overcome history with the Evoque convertible. We still don't fully understand the appeal of a convertible SUV, but gosh the Evoque looks good!